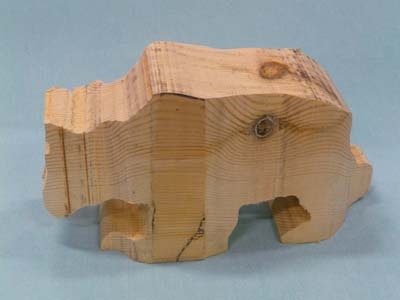 A great deal of time can be saved when you are making a carving by removing the waste wood from around the templated shapes. This article is intended to show some safe and efficient ways of removing the waste. 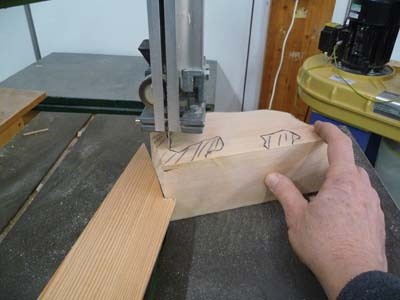 The ideal machine to perform this task is a bandsaw. 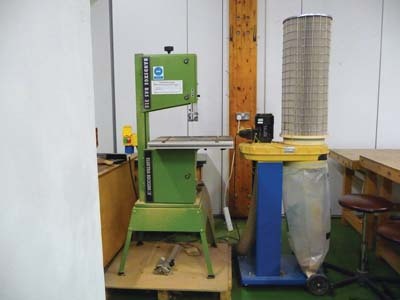 There are many makes and models of bandsaw and they all do a similar job, but as with most tools, you get what you pay for! 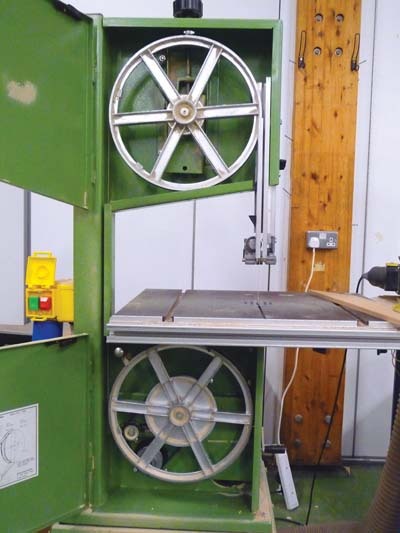 Generally, a two wheel saw with up to a 150mm (6in) cutting face will suit most carvers, unless very large work is being made. The top blade guide/guard shows how the blade is supported on each side by bearings, thus keeping the blade in line. 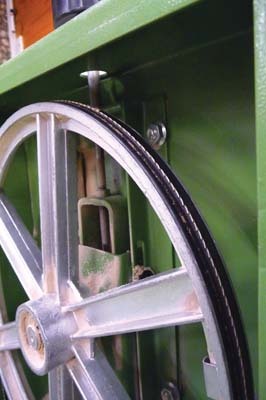 A pair of similar bearings and a thrust bearing, support the blade beneath the saw table. The blade shown is 1/4in x 6 skip tooth. Take two digital photos of elevations that are at right angles to each other, keeping the camera central to the object to avoid distortion. Using a copier, adjust the images to fit the wood. 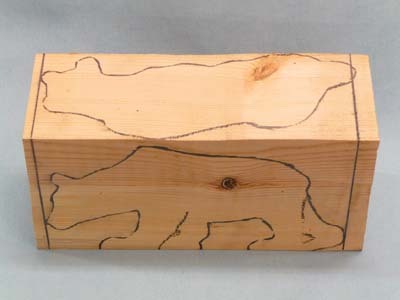 I used the thickness of the wood as a critical measurement to make the plan view, which then dictates the length of the bear. Using the copier, I adjusted the side view so that it was the same length as the plan view. Cut out the images, which are now the templates, and pin them to the block. 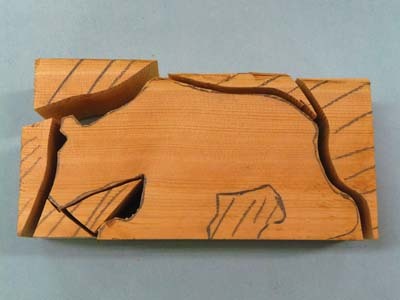 The side faces of the block need to be trued square (at 90 degrees to one another) with a plane or saw (see gallery image 7). Draw around the templates. Make sure that they are the same length (see gallery image 8). Cut around the outside of the shape to remove waste. 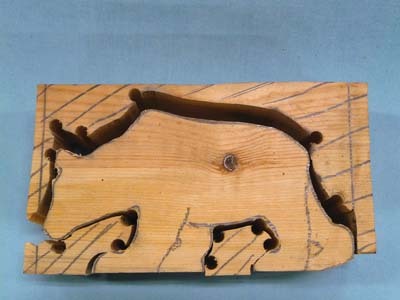 When the outline curves are too tight to follow, run the saw to the outside of the block and re-enter at a better angle, going around the shape removing all the waste. 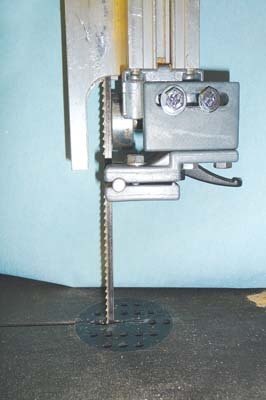 There will be trapped areas that the saw blade cannot enter and these have to be dealt with separately. The use of the saw stick keeping the operator well clear of the cutting edge. 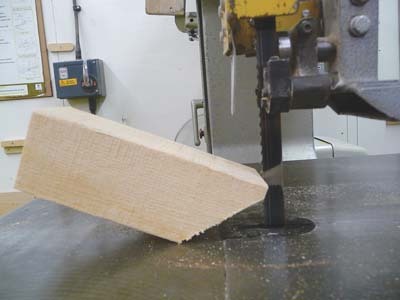 Also the blade guard is adjusted so that very little of the blade is exposed during sawing (see gallery image 9). Turn the saw off as soon as possible after a cut, as it's easy to forget the running blade. Keep the saw table clear of waste wood and get into the habit of using a saw stick to push waste wood off the table. If the scraps are small, then it is better to blow them away. Having cut the waste from the outside of the shape, the trapped or hard to get at areas are next to be removed. 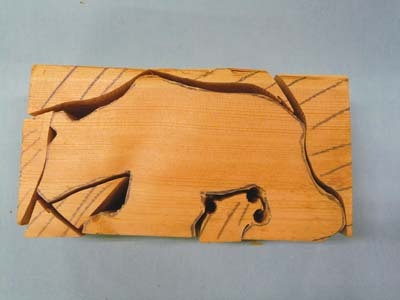 Because the blade cannot turn sharply enough and will get trapped in the shape, a series of relief cuts is made from the cut edge of the block to the outline of your shape. 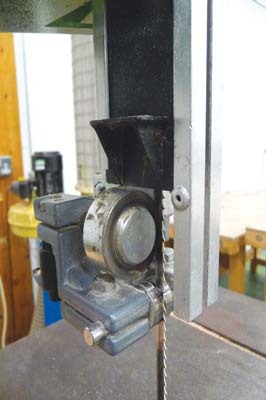 Remember that the blade should not go deeper than its width because if it is any deeper and is withdrawn while the saw is running, it may derail the blade from the wheels. If the blade does go deeper than this, then stop the saw and ease the blade out. 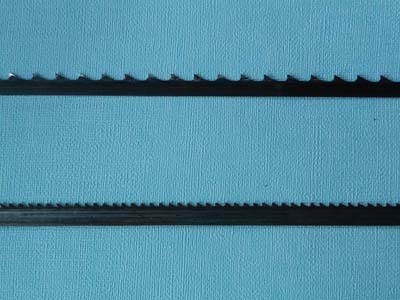 Here the saw blade has been purposely run into a deep cut (see photo 10). It is essential to stop the saw before withdrawing the wood. 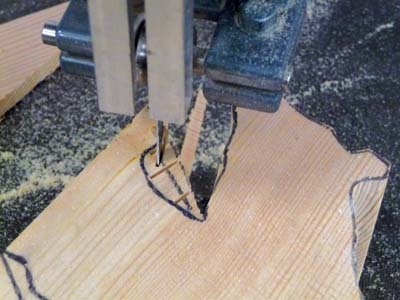 This can be tricky, as sawdust can get behind the blade and can be a fiddle to get the wood clear from the blade. After withdrawing from the deep cut, a second cut can be made which releases the waste â€“ replaced here to illustrate the position of the saw cuts (see gallery image 11). Note the relief cuts made in the waste area in front of the leg - made after the large piece is removed - which will make the next cut easier. In order to ease the removal of the waste from in front of the leg, relief cuts are made to allow the waste wood to come away easily. 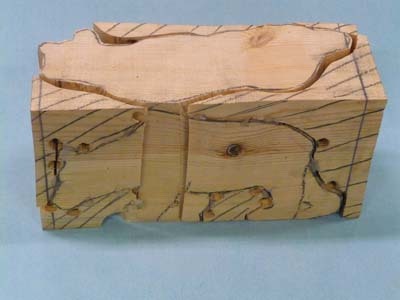 Here we have the block showing the pattern of cuts made to remove the waste from the timber. Notice that the waste in between the legs is still in place (see gallery image 12). Having shown the usual way of removing the waste from a blank, consider an alternative method which saves time and blade wear. Where the drawn outline shape has tight turns, drill vertical holes, slightly wider than the blade, in any tight spot (see gallery image 13). 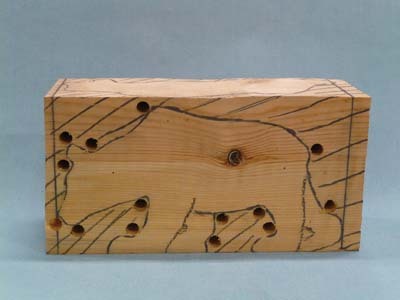 It is essential that the holes are vertical. 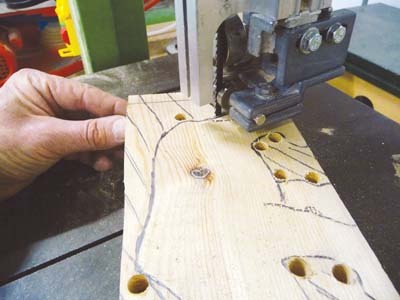 Use a pillar drill to assist with this but if one is not available, then consider an economical alternative - the drill guide is worth considering. To use the guide, first start a hole (3/8 drill for 1 1/4in blade) about 3mm deep within any tight shapes. By simply sawing from hole to hole, the waste area between the legs is sawn out in one cut (see gallery image 14). The method of removing waste from tight spots can be used to remove the waste from all around the template. 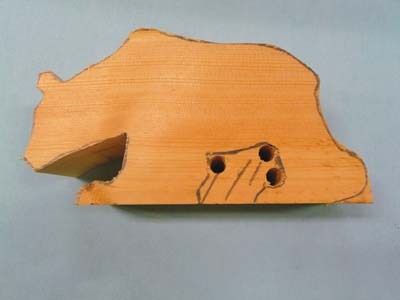 This blank has been drilled out at all the pinch points (see gallery image 15). 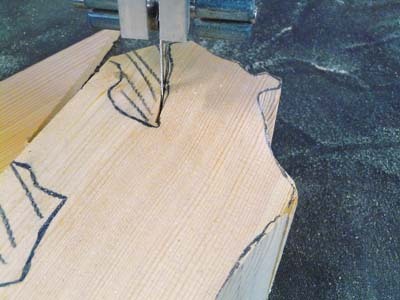 With your bandsaw, cut around the template, going from hole to hole. This method saves a lot of time and blade wear since only the perimeter of the outline is cut (see gallery image 16). The waste has been removed in only three pieces. This has a huge advantage when you glue the block back together, as there are fewer pieces to align (see gallery image 17). In order to saw the top profile, we need to stick the block back together. 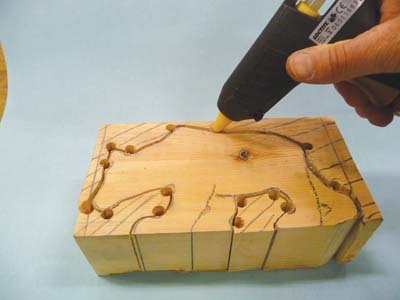 Use a hot glue gun - its gap filling quality makes it ideal for the job. You can use PVA or even masking tape, but I find the glue gun quickest and most effective (see gallery image 18). With the block glued back in one piece, the top elevation can be safely sawn out. Here we have the block showing the final cuts for the top elevation (see gallery image 19). When you remove the waste pieces, you should end up with a rough out similar to this. 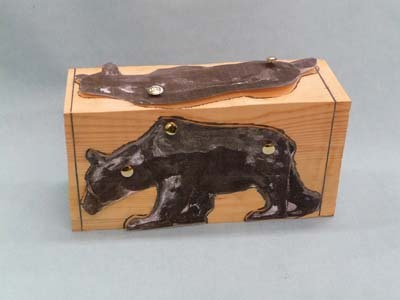 Now all you have to do is get your tools out and start carving (see gallery image 20). 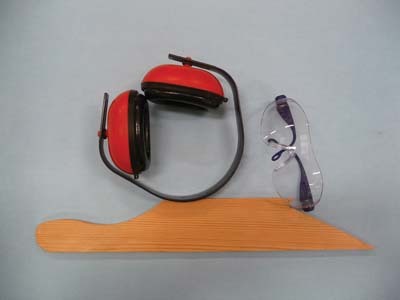 And whilst we are discussing safety issues, don't forget that it is important to safeguard your ears, eyes and fingers. Make sure you use ear defenders and goggles at all times. A push stick is essential for feeding awkward and smaller pieces where there is a risk of catching fingers with the blade.